Shuttling between meetings and maybe, just maybe, my hosts would take me for a hasty visit or drive through some places of interest to give me a flavor of the country. That's what I expected of my business trip to Poland. A lawyer friend told of her three trips to Paris and one to Sophia, Bulgaria in the past year. "All I saw were meeting rooms and my hotel," she lamented. In order to catch some sites, I flew out at the crack of dawn on a Sunday, giving me at least one day to see Warsaw. I made a point to see Jewish sites, visiting Nozyk synagogue, the only one surviving in Warsaw, and the massive Jewish cemetery on Okopowa Street, now overgrown and somewhat derelict, but nevertheless a hint of the 350,000-strong vibrant Jewish community that once was. I found the remnant of the Warsaw ghetto wall in the courtyard of Zlota 62. Standing before it and looking up, I tried to get a sense of what it felt like to be walled in like an animal. Other sites in what was the ghetto include the Umschlagplatz where the Jews assembled before being shipped off to the camps, the memorial on Mila Street (headquarters of the rebellion), and another ghetto uprising monument. I chanced upon a group of Israeli students learning about the uprising from a survivor of the ghetto struggle. He told how the Polish underground was not particularly supportive, that even though a Jewish uprising supported their ends, the Poles withheld assistance until approval was received from London to provide weapons. Even then, the survivor said, the equipment was second rate. On the way to Warsaw's old town, I stumbled upon the changing of the guard ceremony at the Tomb of the Unknown Soldier, where I couldn't help but think of the terror the sight of soldiers marching in formation would have brought to the city's Jews 60 years ago. Neither my parents nor grandparents are from Poland, nor did my family lose anyone in the Holocaust. But I still may have been overly sensitive and couldn't help but feel I was chasing ghosts all the time. This is where the Jews lived. Something was here. Something was there. Always in the past tense. At the Jewish sites, this is to be expected. But it seemed that Poland's vanished Jewish past is all pervasive. Mind you this was no Jewish roots tour but rather a business delegation looking for cooperative opportunities with Polish companies. The visit became more personal for me from members of the delegation who did have a personal link, turning the business trip into an unforgettable experience. Wrapping up for the day after meetings near the city of Lublin, our group visited Majdanek death camp. One of the delegation members believed his father had been interned there. "I never imagined I would come here," he repeatedly said, shaking his head in disbelief as we walked by the wooden barracks. He never believed he would visit Poland, a place his mother never wanted to see again. Yet there he was, ironically looking for Polish-Israeli business cooperation. A few hours after seeing the gas chamber and mountains of human ashes at Majdanek, we were strolling around Lublin's town center, impressed that the city acknowledges its Jewish past by including a Jewish Heritage Trail among four tourist routes highlighting the city's history. Signs with a blue Star of David marked the Jewish route, which featured cemeteries and a memorial. Someone had drawn a gallows on one of the signs to "hang" the Star of David. We wiped off the graffiti. Another day, I accompanied one of the delegates on a three-hour detour through rolling green hills in idyllic countryside to Proszowice, the southern Polish town where his father had grown up until, at age 14, he fled from the Nazis. 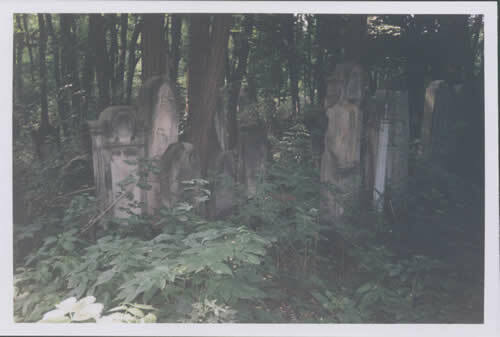 The Jewish cemetery, where his grandparents are buried, was nearly hidden by a field thickly overgrown with weeds. When we reached the Star of David-decorated iron gate and found it locked, we squeezed through a gap in the fence. That is where we had the shock of the day: the gravestones were all gone. Not broken or vandalized. Gone. All that remained was a recent additiona low cement wall embedded with some complete gravestones and fragments of others. "I can't believe this," he kept repeating as he shook his head in disbelief. Whether he couldn't believe he was in his father's hometown or that the entire cemetery had vanished, like the Jews of Poland, I don't know. The following day, after visiting a factory in the city of Wraclaw where slave laborers made Messerschmitt fighter aircraft parts during the war, we were taken to see the city's synagogue, which survived the Nazis because it is part of a compound of buildings. Fearing its destruction might harm surrounding structures, the synagogue was spared. But the Nazis put it to use: the building courtyard was used to assemble Jews for deportation. The communist government was reportedly only slightly more respectful to the synagogue, but now the building is back in Jewish hands and is being slowly renovated. Returning to their homes in Poland after the war, we were told, Jews were chased away and, in some cases, killed by those who had taken over their property. Since Wraclaw had been part of Germany, there were no Polish squatters, so Jews were able to settle there. "My grandfather is Jewish," the young man showing us around the synagogue told us. "And I am part of the Jewish community." When asked whether Chabad has any presence, the young man told us that Chabad is not in Poland because the Lubavitcher rebbe apparently declared Poland one big Jewish graveyard. When my cohort agreed, the young man was taken aback. "I'm here," he protested. He is the sprout emerging from blackened soil after a fire has destroyed a forest, or perhaps merely the custodian of the remnants of a once-great past. One cannot visit Poland without seeing Auschwitz. Taking the train to the southern city of Krakow, I felt awkward as I couldn't help but associate trains and Poland with one thing: death camps, which was precisely where I was going. A few hours later, I was standing at the railway siding at Birkenau where the infamous "selections" were made. Who would be gassed to death immediately, and who wold be forced to live through the camp's hell. For Poland, Auschwitz is a tourist attraction. "Ah, you're going to Krakow," the Warsaw taxi driver said on the way to the railway station. "So you will visit Auschwitz and the salt mine?" Even at a pure tourist site like the Wieliczka salt mine, an underground world which includes a massive ornamental chapel, all made of salt, we learned that Jewish slave labor was put to work making aircraft engines during the war. In some instances, the Jewish connection is exploited. Companies in Krakow offer tours of what was the city's Jewish quarter, with one company not even getting the spelling of "Jewish" right! Another offers a "Jewish-style Dinner" complete with traditional dishes and concerts of Jewish music. 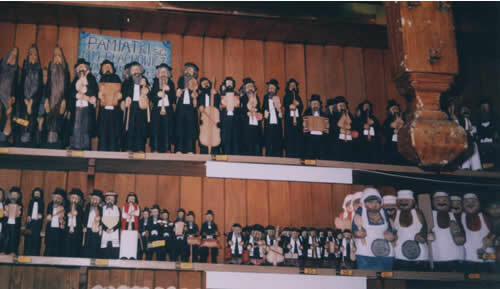 Tourist shops sell wood-carved statuettes of Jewish musicians --a "cute" reminder of the people gassed to death just 70 kilometers to the west. So many reminders of a vanished past. It seems the rebbe was right.